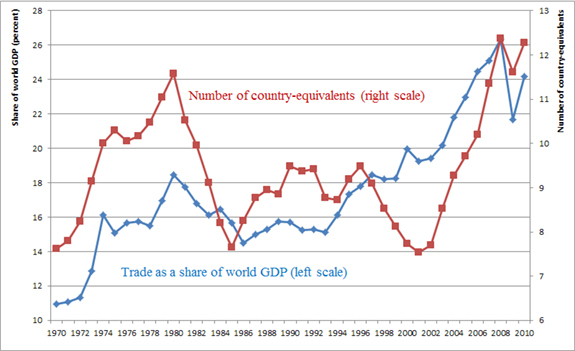 Notes: Country-equivalents , where si is the share of each country in world output. A higher number denotes a more equal distribution of output. More than before, flows, and similar kinds of flows, are going in both directions. After World War II, similar goods were flowing (think cars) between the rich countries. With integrated supply chains, unfinished goods go back and forth. This is criss-crossing globalization. We illustrate this with the example of foreign direct investment (FDI). It is much harder today to speak about "receiving" and "sending" countries, as FDI goes in both directions, between rich countries themselves, but also increasingly with emerging market countries investing in the developed world. Note: The Grubel-Lloyd index is computed for each country with nonzero positive flows. 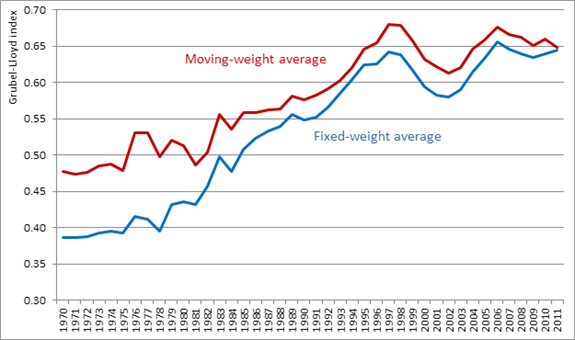 Each country is then weighted by its share of total FDI flows, with weights corresponding to the current year (red line) or with weights that are fixed at their mean over the period (blue line). The figure shows five-year moving averages (to avoid large spikes). China has become a "mega-trader" in two senses. First, it recently overtook the United States as the world's largest trader. Under realistic growth projections, it will pull further away from the United States and other countries. Second, and more impressive, is that China is a mega-trader compared to its own characteristics: A country is expected to trade more relative to its GDP when it is richer and when its size is smaller. Controlling for those criteria, China substantially over-trades, only slightly less than the United Kingdom did at its peak. On this second criterion, the United States in its heyday and Japan in the 1980s were under-traders (figure 5). 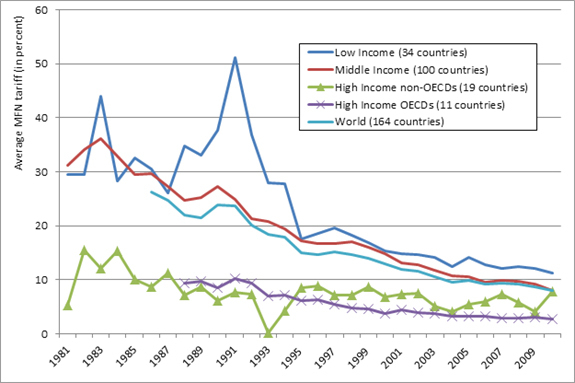 Note: We regress exports to GDP (in log) on size (population, in log) and income (GDP per capita, in log). For 2008, we exclude small (<5 million habitants) and oil exporting countries. 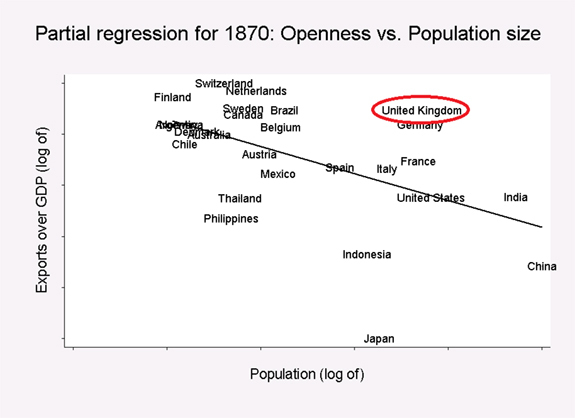 The charts present the bivariate relation between size and openness, controlling for income. A country above the line is more open than expected given its size. 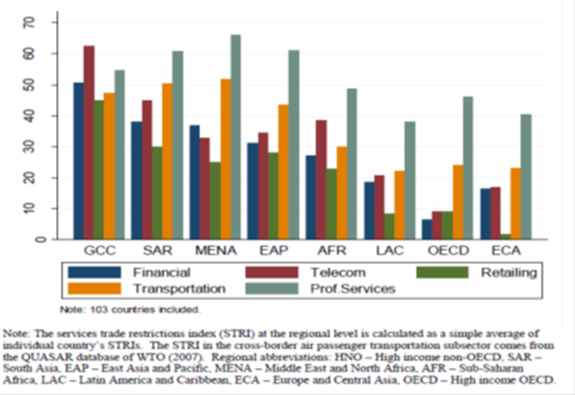 A lot of the liberalization in the era of hyperglobalization has occurred in the context of preferential trade agreements, which increasingly address "behind-the-border" barriers (see figure 6). In part, this is because the Doha Round of multilateral negotiations remained stalled. This trend will be reinforced with the two mega-regional agreements being negotiated by the United States, the Trans-Pacific Partnership (TPP) with Asia, and the Transatlantic Trade and Investment Partnership (TTIP). About $2.5 trillion of trade in merchandise takes place within these two blocs, which accounts for 17 percent of world trade (the number would be higher if one includes services). We have witnessed a long-term decline in tariffs across the world. This phenomenon is true across regions and has withstood the financial crisis, despite fears to the contrary. 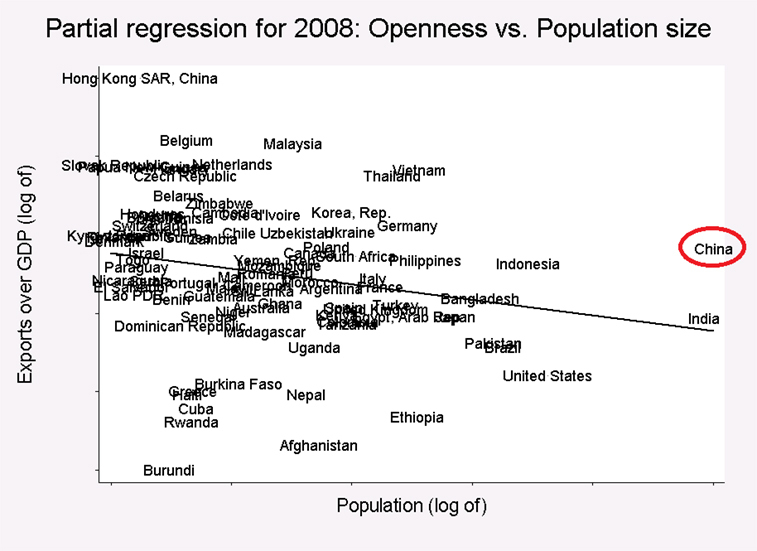 But Is the World Less Open Policy-wise? There is a paradox: Liberalization is occurring all across the globe but the world may be getting more closed, or at least less open than people believe. This is because of two compositional shifts. Global output is moving away from less-protected manufacturing toward more-protected services (see figure 8) and from less-protected rich countries to more-protected poor countries (as shown in figures 7 and 8). Those shifts make the world as a whole less open and attenuate the liberalization trend that stems from all countries reducing barriers. Source: Borchert, Gootiz, and Mattoo 2012.